One pair of 18 karat yellow gold and sterling silver earrings. 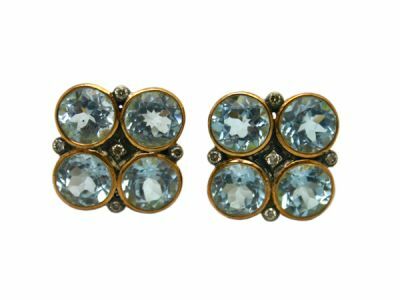 In each earring, four bezel-set round facetted cut blue topaz (8 topaz= 12.4carats) make a square design. Set around these four blue topaz in sterling silver are five bezel-set round brilliant cut diamonds (10 diamonds in total= 0.15carats, SI clarity, M-N colour). The colour of the topaz is a beautiful cool-blue.